Schriever Air Force Base–one of the newest bases in the Air Force. Schriever AFB is the home of the 50th Space Wing, the Space Innovation and Development Center, the Missile Defense Agency’s Joint National Integration Center, 310th Space Group and numerous tenant organizations. The 50th Space Wing’s mission provide combat effects to the war fighter, to include precision navigation and timing and secure satellite communication, through command and control of DOD satellite systems. The other units at Schriever also perform space missions. We are unique in that we have no flight line and no aircraft mission. 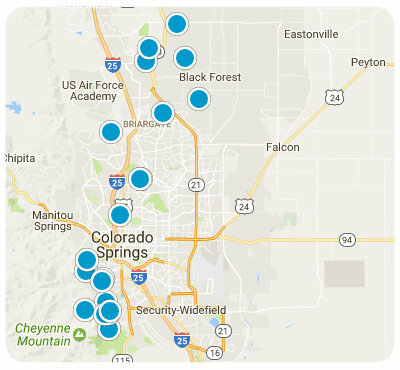 The Colorado Springs Post Office (ZIP Code 80912) serves Schriever AFB postal addresses. All Colorado state statutes apply to driving on Fort Carson. Additional federal regulations apply, such as mandatory helmets and reflective vests for personnel operating motorcycles on and off post. Military traffic violators are subject to the Uniform Code of Military Justice, or the Magistrates Court depending on the offense. All civilian traffic violators are subject to the U.S. Magistrates Court. How do I get onto the installation? All vehicles coming onto Schriever AFB must have a Department of Defense-issued registration or be issued a temporary pass. Short-term visitors may be issued a temporary pass for the duration of the visit. Vehicle owners must provide current registration, proof of insurance and a valid driver’s license. All decals, passes and Schriever-issued identification must be returned to Pass and Registration at the end of the visit. How do I get to Schriever AFB? From Colorado Springs, drive east on Platte Avenue until you reach the intersection with Highway 94. Turn right onto Highway 94, driving east until you reach Enoch Road. Turn right onto Enoch Road, which will take you to Schriever AFB. The visitors center is approximately two miles from Highway 94 and is on the right side of the road just inside the fence.